Two victims were attacked by four young men in Miami Beach after the city’s Gay Pride Parade Sunday [April 9, 2018] in what police think may have been a hate crime. In video footage of the incident, four young men — one wearing a Florida International University T-shirt — are seen walking up to a bathroom area on Ocean Drive and Sixth Street at about 7:40 p.m. Sunday. Two other men walk out, and are immediately attacked by the four. One of the attackers shouts a Spanish slur used to refer to LGBT men before he and the other attackers begin repeatedly punching the two men. When the two victims, who sustained multiple injuries to their faces, began to run away, the attackers chased them, Miami Beach police said. That’s when Helmut Muller, who was standing near the bathrooms at the time of the fight, went after the attackers to break up the fight. Muller said he saw when the men walked up and said the fight was completely unprovoked. Muller said the two victims were injured badly, with multiple bruises and cuts. When he tried to break up the fight, one of the attackers knocked him out and he hit his head on the concrete, he said. The fall left Muller with a large gash on the back of his head that required four stitches and a pool of blood on the pavement. The attackers then ran toward the beach. Below is the local Miami CBS4 affiliate news story. 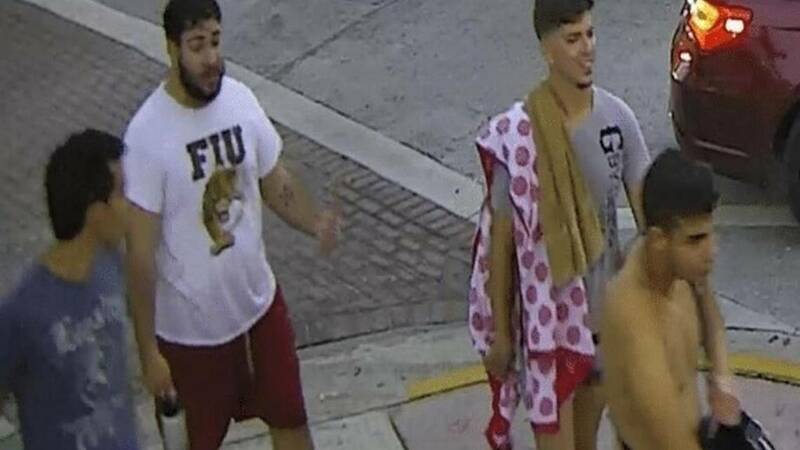 Four men surrendered to authorities Tuesday, two days after they attacked a gay couple following the Miami Beach Gay Pride Parade, police said. Miami Beach police said each suspect faces felony charges. They were identified as Juan C. Lopez, Adonis Diaz, Parblo Romo-Figueroa, all 21, and Luis Alonso-Piovet, 20. See full story here. Have fun in jail boys!